Saute onions in hot olive oil over medium heat until tender and slightly browned on the edges. Add bell pepper and saute until heated through. Stir in sugar until dissolved; remove from heat. Combine mangoes, tequila, 1/2 tablespoon lime juice, and onion mixture in blender. Puree in blender until smooth. Combine minced jalapeno, cilantro and remaining 1/2 tablespoon key lime juice in small bowl; salt to taste. Let stand until ready to serve. Heat charcoal or gas grill to medium-high. 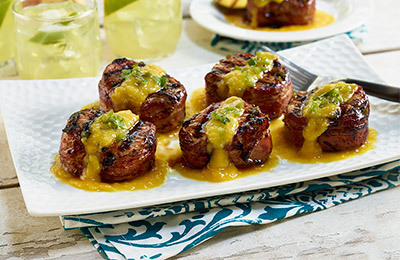 To serve, spoon Mango Tequila Sauce onto 4 plates; top each with 2 grilled filets. Garnish with minced jalapeno mixture.